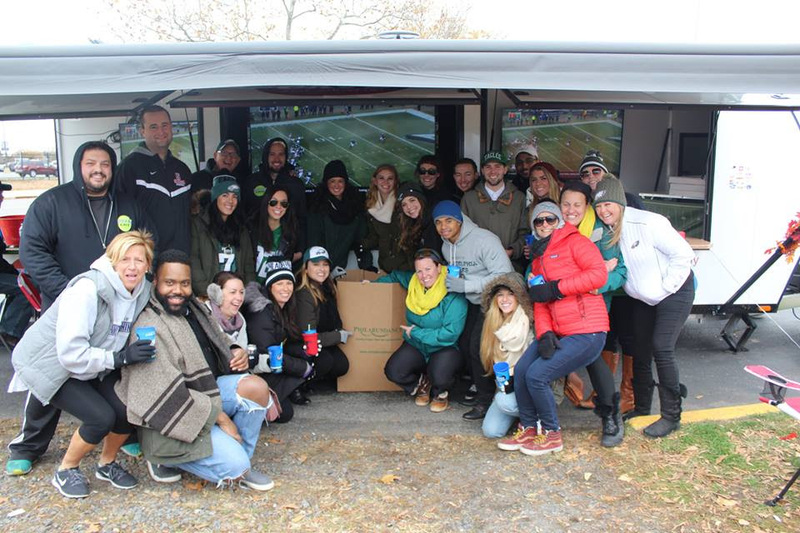 This Sunday, November 20th we tailgated in style with Phan Cave and Philly PR Girl at the third annual Turkey Day Tailgate at Schmidt’s Commons. The evening was complete with Thanksgiving-themed bites and an open bar featuring Josh Wines, Miller Lite Beer, Quaker City Malting Co. and Fireball Whiskey while we watched the Philadelphia Eagles play the Seattle Seahawks. 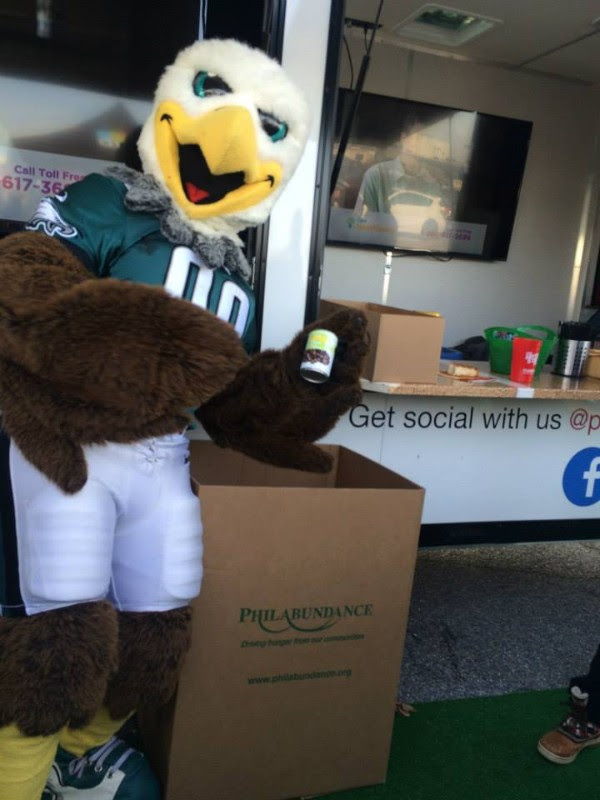 Although we didn’t get to witness an Eagles win, what made this event even more special, was that all guests joined in celebrating the giving season by bringing non-perishable food items to support Philabundance, the region’s largest hunger relief organization. This year’s plans included a new venue, Crabby Cafe and Sports Bar at Schmidt’s Commons. Every guest was given raffle tickets to enter to win prizes like autographed memorabilia or even tickets to see the Kings of Leon. Inside the tent, guests could escaped the dropping temperatures and harsh wind while live footage was shown on the Phan Cave trailers, as well as displayed outside on the 400 ft. projection screen in the courtyard. This year’s tailgate also included a Turkey Tailgate Cook-Off judged by chefs and celebrities like Gina Gannon, Ben Franklin, Bex from Radio 96.5, Geno Vento from Geno’s Steaks, Toke Luke, and Roberta from Homemade Delish. Participants in the cook-off included Devault Foods,Crabby Cafe and Sports Bar, June Allan, Monarch and Pastificio put their own spin on Thanksgiving classics. Pictured above is the winning Turkey Sandwich from Pastificio complete with turkey, stuffing, cranberry sauce, and hot gravy drizzled on top. Other offerings included a turkey gumbo over rice, fried turkey sandwich, and turkey cheesesteak. Whole Foods provided Pumpkin Pie for dessert. Phan Cave and Philly PR Girl are proud to support nonprofits that help make Philadelphia a healthier, cleaner and safer city. Phan Cave has partnered with several organizations, such as Penn State’s THON and #Tailgate4Good. Philly PR Girl has worked with local and national groups including: Unite For Her, DVLF and MS Society to name a few. Both companies are excited to continue partnering with Philabundance for this event. Each week, Philabundance provides food and services to approximately 90,000 low-income residents in the Delaware Valley who are at risk of hunger and food insecurity. To learn more about Philabundance and volunteering, donating or hosting a food drive, please visit their website.